Why does this issue occur in the first place? Is there anything the user can do / can do differently to prevent this problem from happening? I browsed many articles on the internet and checked around the SP SE for related content, or answers, but was not able to find any. If you have any insight, it would be greatly appreciated! EDIT 1: Thanks Michael Bailey for requesting clarification (though next time, the comments section would work better) I have attached the error message below. 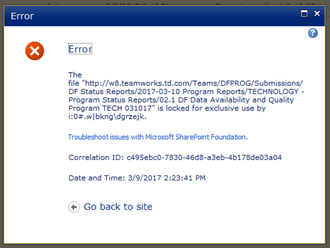 Please note that this image was screen capped by the same user that checked out the document to begin with. Set unique permissions on the document Library for your users to read. From the information you have given it sounds as though your users only need to view the documents. I had a similar issue of documents continually being checkout (people were mistaking checkout for downloading) so we removed there rights - striped them back to read. As for why - could be multiple reasons. Not the answer you're looking for? Browse other questions tagged check-in troubleshooting or ask your own question. How can I recover a saved version of a document, that was not checked in?